Look what we made with a simple shamrock template. My 11-year-old boy sewed up these cool hanging felt shamrocks for our window. He wanted me to make sure that you know he was VERY bored and needed something to do and he got to use the sewing machine —stressing the MACHINE part, so it was all good. Afterall we can’t make slime every day! Well, mom can’t! There are so many fun things to do with shamrocks. We especially like these shamrock coloring pages! Kids will love the find the four-leaf clover activity page and the puppy with a shamrock spot on his eye is too cute. I have loads of St Patrick’s Day ideas. I hope you will check them out. We think the rainbow cupcakes are super cute. 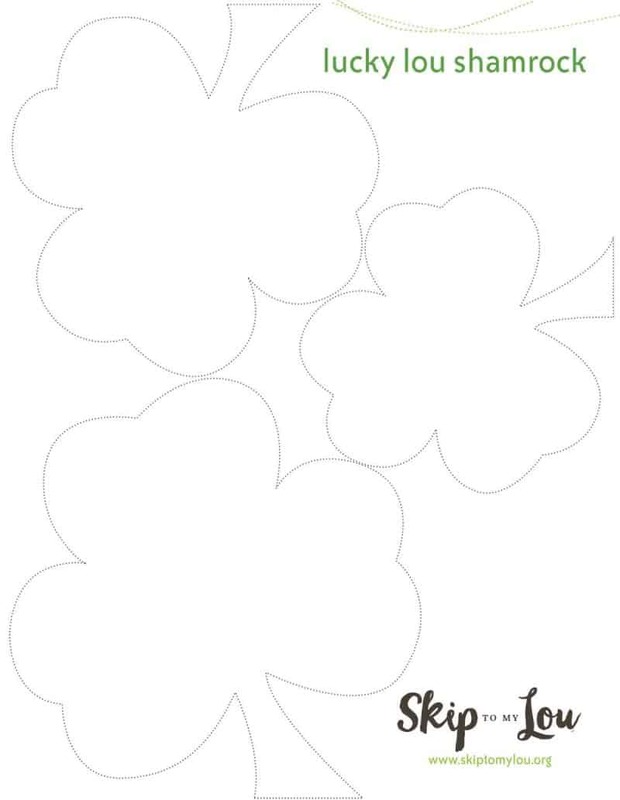 Download the free printable shamrock template. There are three different sizes so you can have a variety of shamrocks. Printing on cardstock will make it easier to trace around the shamrock outline. Download and print the shamrock template. Cut out the paper shamrocks. Pin two layers of felt together. Lay a shamrock template on top of the felt. If you want a hanger for the shamrock, slip a length of ribbon in between the layers of felt at the top of the shamrock. Sew all the way around this shamrock outline, making sure to catch the ribbon between the layers at the top. Cut out a shamrock close to the stitching line and around the ribbon. Be careful not to cut the stitching line or cut off the ribbon. My crafty boy added a few beads on the ribbon and now the shamrocks our hanging in our window—hopefully bringing us lots of luck! They really do make the perfect St Patrick’s Day decoration. Hope they bring you loads of luck too! Whip up some crochet shamrocks to be sure!! Don’t stop with St Patricks’s Day you could do this same project for Valentine’s Day or just to spread a little love with this heart template. Don’t be afraid to let your child sew. They will love it! 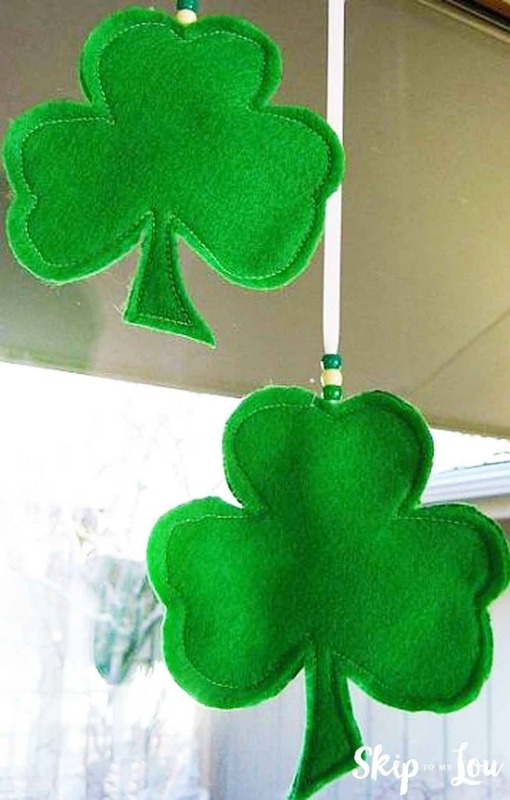 These hanging felt shamrocks are a great first project. It is easy and gives the child something to display and make them feel proud. A win-win. Plus they are learning a life skill that will come in handy later in life and can provide hours of enjoyment. I am a huge believer in sewing practice sheets to help kids learn to sew. This shamrock template works great for this. Just print out the page in black and white. Remove the thread from the sewing machine and have them sew on the shamrock outline. I also have these sewing practice sheets for even more practice. Great shamrocks. It's Friday, the 13th so I'm running late this year. But great shamrock patterns I can use next year and great job by your son. I'm going to add Skip to My Lou to my blog as soon as my computer is working consistently again. I love these and he did a great job with them! I am linking them to my site for a party idea. Thanks!!! Tell your son I LOVE THEM! I have missed you and your blog (see my blog for my leg dramas)! It is good to be back! dude. he totally ROCKED the MACHINE. Wow! Those of us lucky (get it!) to know your son, know what a talented, kind and caring guy he is! I don't know of too many 11 year old boys that can cook, clean, baby-sit, ski like a pro, install hardwood flooring (yes, I REALLY did say that), play basketball & baseball with skill, knit scarves for his teachers, not to mention sew -- blankets for lonesome babies in China and shamrocks for his family! Some girl out there is going to be awfully lucky in about 15 more years! Did I mention he is a really cute and nice kid? Okay, I may sound like the proud aunt -- but this is all true and everyone who knows him agrees! He is also "lucky" to have a very talented and kind, patient mom and dad! We love you!! I love these. So neat! He did a GREAT job! I love those. Please tell him he did a wonderful job! Hello there, I love those shamrocks.. great idea. I hope you don't mind but after having seen your crayon roll tutorial on Sewmamasew, I had to make one, (featured on my blog today). And I have credited your site and tutorial on my post... from the comments so far, looks like a lot of people will be making your crayon rolls! Those are great! The beads are the perfect crowning touch! May you have all the luck of the Irish!